The D-45 and D-75A are perfect for moderate power applications such as recording or broadcast studio near-field monitoring, video suite audio monitoring, a recording/broadcast headphone amp or a small paging system. 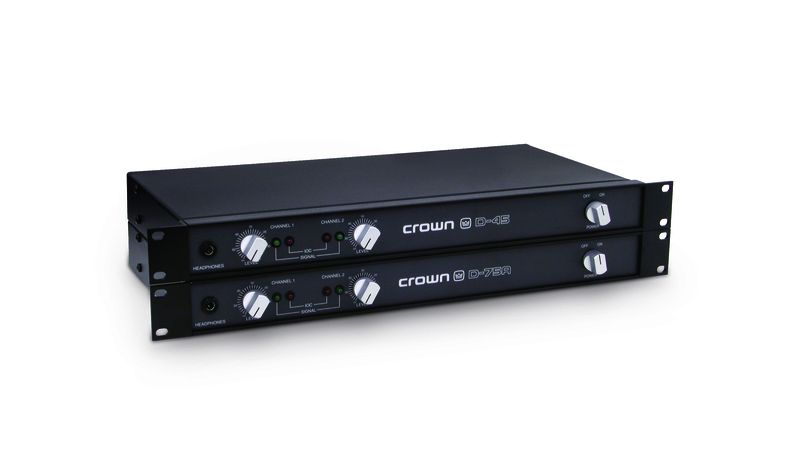 Designed, built and carefully checked to ensure reliable operation with a wide variety of loads, Crown D Series amplifiers are convection cooled. Their high reliability is particularly important in reducing maintenance costs. •Powerful AB+B class circuitry yields maximum efficiency with minimum crossover “notch” distortion. •IOC® (Input/Output Comparator) alerts of any distortion that exceeds 0.05% to provide proof of distortion-free performance. •Signal presence indicators verify the presence of amplifier output. •Detented level controls for precise repeatability. •Ultra-low harmonic and intermodulation distortion result in the best dynamic transfer function in the industry. •Very low noise and wide dynamic range. •High damping factor provides exceptional loudspeaker motion control. •Convection cooling system eliminates fan noise and maintenance. •Mounts in a standard 19-inch (48.3-cm) rack. •Three Year, No-Fault, Fully-Transferable Warranty completely protects your investment and guarantees its specifications.